These days I am all about veganizing. I love creating new recipes. I love making vegan recipes from cookbooks, magazines, the interwebs etc. But I also fancy taking a meat and dairy extravaganza and adjusting it to fit my lifestyle. I have blogged a few times about baking blog Eat the Love. It’s filled with all kinds of amazingly fancy, decadent wonders of sugar and flour and chocolate and all that desserty goodness. The blog has a few vegan recipes, but most are not. One of my favorite things to do is to see which of Irvin’s awe-inspiring recipe will work in vegan form. 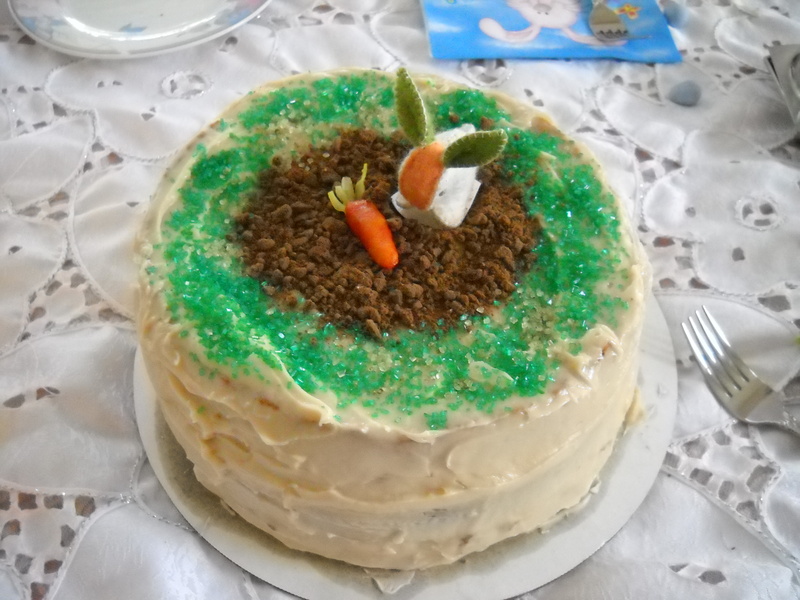 For Easter Sunday, I decided to veganize the Carrot Pineapple Spice and Brownie Layer Cake with Whipped Cream & Cream Cheese Forsting andddd Marzipan Carrots. I had a long, but wonderful day in Ojai the day before Easter and I did not anticipate how tired I would be when I got home. I powered through and made this cake. I took a few shortcuts, like instead of making a carrot juice reduction, I just added a 1/4 cup carrot juice. This probably changed the cake in ways I don’t understand, but everyone still liked it, so whatever, I do what I want. I also made a single marzipan carrot because although I had a brand new tube, it kept crumbling and falling apart….giving me an all around difficult time, so I tossed it. So, rather than post the vegan version, I’m just going to give you the notes today. 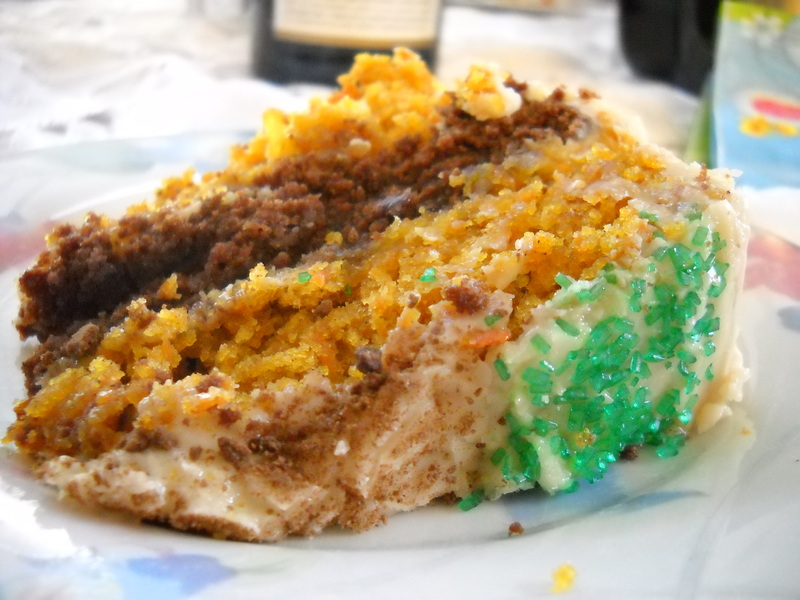 Carrot Pineapple Spice & Brownie Layer Cake with Cream & Cream Cheeze Frosting and a Single Marzipan Carrot. 1. For the 3 eggs I added 1 tbsp plus 1 ½ tsp of Ener-G Egg Replacer dry. Do not mix with water. 3. For the brownie layer, use your favorite vegan brownie or chocolate cake recipe. Try to pick a recipe that makes moist or cakey brownies. My brownies were of the more traditional variety, less cakey and a bit more dense—like a blondie. My testers said that although they liked the flavor and texture of the brownie layer, they would have preferred if the brownie layer was the same consistency of the carrot-pineapple layers. I thought my cake turned out pretty hideous, especially in comparison to Irvin’s masterpiece, but people seemed to think it was endearing. It’s so cute! And who cares what it looks like as long as it tasted great 🙂 It looks like quite the undertaking.